How to create and setup a new project. 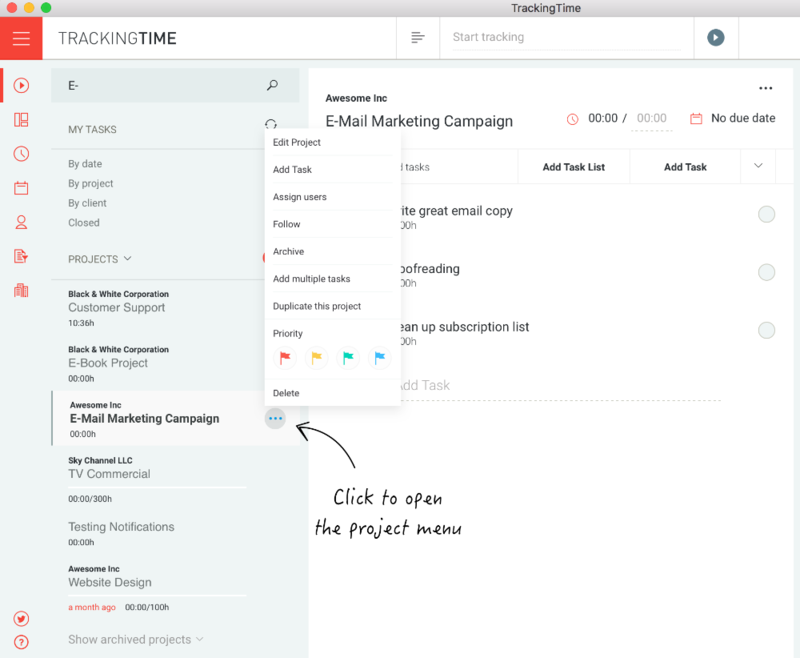 TrackingTime helps you keep all your projects on track. As an account administrator or project manager, you can create new projects and track time spend on each individual project task by your team members. Clients, projects and tasks help you categorize your time entries into different levels, so that you can get the kind of accuracy on your reports that you really need. Creating a website, writing a book, organizing an event or constructing a house. Depending on your company business, a project can be pretty much anything. 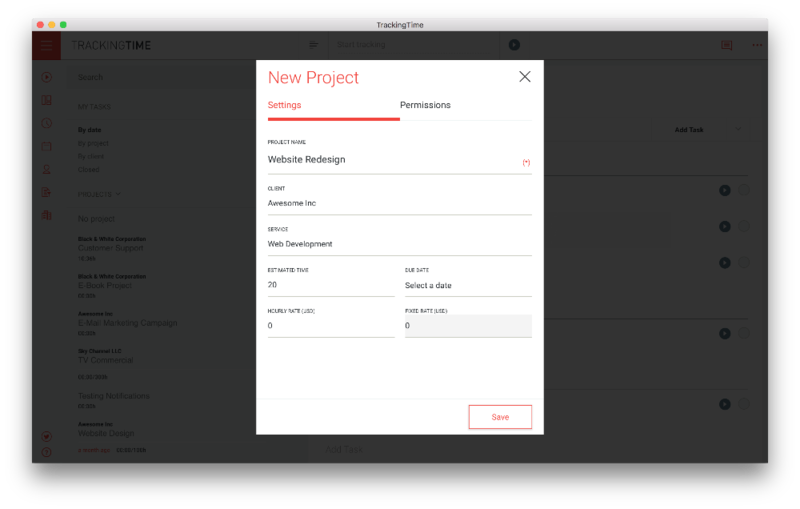 Once you have added a new project, you can assign users to it, start adding tasks and track the time you and your team spend working on them. In case you have lots of project tasks to get done, you can also use task lists to categorize them into groups. Tip: Optionally, a project can be associated to a particular client and to a service that your company offers. This allow you to analyze how you company spends time across different clients and services offered. This is particular useful for service-oriented companies who work on many different projects for different clients and the same time. Project name: Choose a name to describe this project. Project names are not unique. Client: Optionally, you can associate a project to a client. Service: The service field helps you to categorize project times into the type of services that your company offers its clients. This parameter is optional. Estimated time: The amount of hours you think will be required to complete this project. Due date: Click on ‘Select a date’ to choose the date by when the project should be delivered to the customer. Hourly rate: If you get paid by the hour for a project you can enter your hourly rate in this field. Fixed rate: Choose this billing parameter to set up a fixed rate for the project that will be billed to your client. When you're ready editing the project's details click on 'Save' to add the new project to your account. In case you often work on similar projects you can easily duplicate an existing project into a new one. To do so, select the project you want to duplicate from the list and then click on ‘Duplicate this Project’ from the contextual menu. 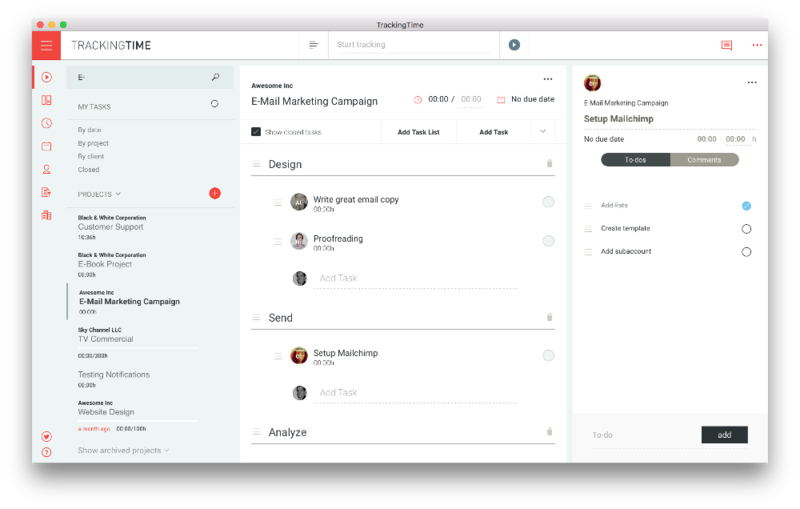 All task lists, tasks and to-dos from the original project will be duplicated in a new project. If you work on multiple projects at the same time, you probably have certain projects that require some special attention. You can follow those projects to be notified more about updates and to be able to view them in the Projects Report. If you want to stop following a project, click on ‘Unfollow’ from the project’s menu. Use the project priority to assign a different color to each project depending on how important it is. The project activity color will be used in the Analytics Dashboard and in your account calendar to better visualize your times.